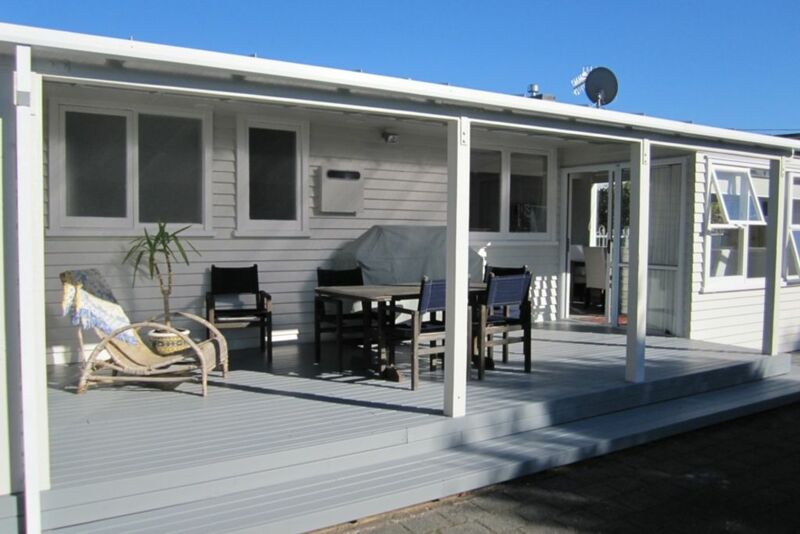 Sunny renovated holiday home in the popular central Bird Area of Taupo. Perfect location only one street back from Taupo's main swimming beach and a short stroll to town. There is a large covered deck area perfect for BBQ's The Activities and games supplied are sure to make your holiday memorable. Table Tennis, Darts, scrabble .... and even a skateboard half-pipe in the front yard! The Kayak is on wheels so very easy to push down to the lake (for safety please bring your own lifejackets) The kayak is suitable for one adult and one child. Fenced secure yard for children, boats, cars or family pet! * Pets welcome - outside only please. * Secure fenced area also provides safe parking for boats, cars etc. Linen (included): - Beds will be made up ready for your stay, Towels for use within our holiday home provided (please bring your own beach towels). IMPORTANT: Our holiday home is in a lovely neighbourhood - it is not suitable for gatherings and/or party's - these will not be tolerated. This home is offered for rent for the quiet enjoyment of holiday makers. Family fun......yes. Party's....definitely NO. We love the outdoors, travelling and exploring. This is our personal family holiday home. We love Taupo and the wonderful outdoor experiences it offers. Child and pet friendly. Fenced secure back yard. We love seeing families have fun together - playing games, strolling and exploring - the location and layout of our home hopefully encourages this. Safe Electric Wall Heater combined with our Gas Fire makes this a very cozy home. Off street parking - plenty for a boat and 2 cars. Full kitchen with refrigerator, stovetop, oven and sink. All cutlery, crockery, pots and pans provided - along with dishwashing powder, cloths and towels. All you need to bring is your food! Large front lawn and fenced back lawn. Awesome house. Perfect for our stopover and has everything we needed. Great location and nice and tidy home. Kids loved the game room in the garage and so easy to arrive and leave. Highly recommend and would definitely stay here again. Excellent. Very tidy, clean, well presented, well appopinted, comfortable, good area, great section for our wee dogs. The best shower I have ever experienced !! Thank you. We will defnitely use you again. Love this house, cosy in the winter months. FREE use of Kayak, Table tennis, darts and skateboard half pipe! Child and pet friendly. Fenced secure back yard. Sunny holiday home in the popular central Bird Area of Taupo. Perfect location - one street back from the lake. Stroll along the lake to our marina (15 min) and the start of the mighty Waikato River (NZ's longest river), and continue all the way to the world famous Huka Falls (2hrs) passing natural thermal pools.....or just enjoy Taupo's main swimming beach (2 min) and the magical view of Mt Ruapehu and Mt Tongariro. The village style town centre, cafe's and restaurants are all only a stroll away.